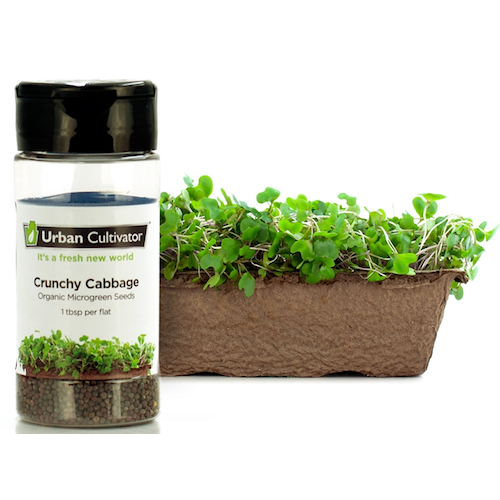 Organic Crunchy Cabbage seeds perfected for indoor growing. Grows four flats of Crunchy Cabbage microgreens. Cabbage is one of the most ubiquitous vegetables, and it comes in many varieties—red, purple, green, and Napa cabbage (the latter of which is usually found in Chinese cooking). It’s one of the oldest vegetables around, dating as far back as the 1600s. Cabbage has been proven to contain anti-bacterial and anti-viral properties. It also contains antioxidants, known as quercetin,that behaves as an antihistamine. If you’re suffering from allergies, try some cabbage!